I’ve been avoiding my Sencha silk for a while. It’s been very easy to do. I told myself that I was busy, but I’m always busy. I was really just scared. 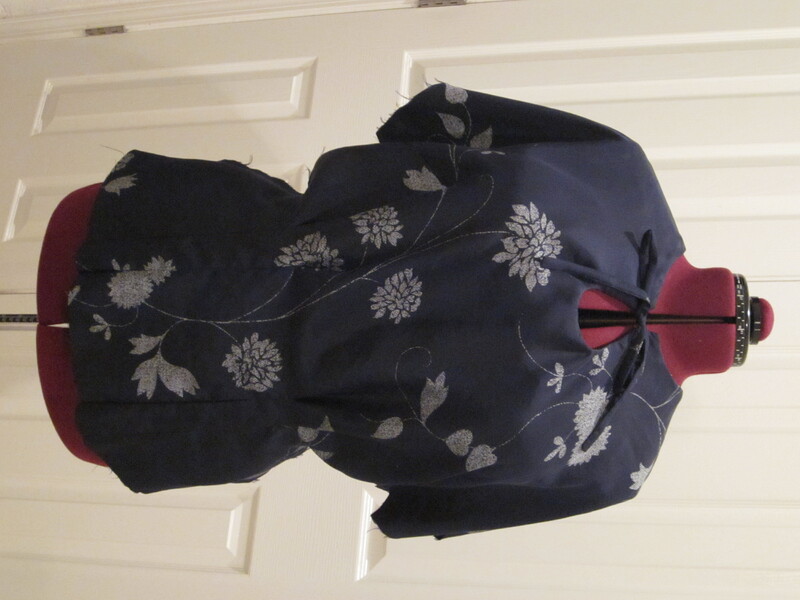 I was scared because the next steps were to sew the ties and the neckline seam. The ties had been troublesome when I’d tried them in cotton. They were so tough to turn that the chopstick I’d been using popped right through the end seam. How much harder were they going to be in silk? Turns out they were easier! Once I got the sewn end going, the silk slipped right over itself; and the chopstick did not push through. I was so wrong. Well, no tears quite yet. One of the ties was misplaced by a very noticeable eighth of an inch. I had to get out my dreaded seam ripper and try it again. But no problem. Pinned outside the seam allowance. I guess it’s all in the pins and needles. Before starting this project, I invested in a set of silk pins. (Unfortunately for my fingers, they don’t have glass or plastic heads. Ouch.) They have their own blue tomato so I don’t mix them up with any other pins. I also (as always) started with a brand new needle of a nice small size (7 or 8, I can’t remember what I had on hand). The only challenges the silk has presented have been cutting and seam finishing, but I’ll have full rundown on those issues when I do the wrapup. Until then, here’s a peek at my progress. Does this blouse look scary to you? But I still can’t wait to get back to cotton! lovely. I know what you mean about cutting into the good stuff and I am sure we are not alone! I cannot imagine doing an entire dress. Too frightening!